This is a scroll for a customer in the backyard of Utah. He is a massage therapist and this is part of the concept of his practice. The writing is Yugen, which means subtle grace; hidden beauty; yugen; mysterious profundity; elegant simplicity; the subtle and profound. It can also be a word for the occult. It is written in Gyousho, which is semi-cursive by Yoshimi "Ryugyoku" Yamada. The cloth is white with a small ivy karakusa (arabesque). The ichimonji is blue with a gold koi, which has some symbolism in the Koi turning into a dragon. 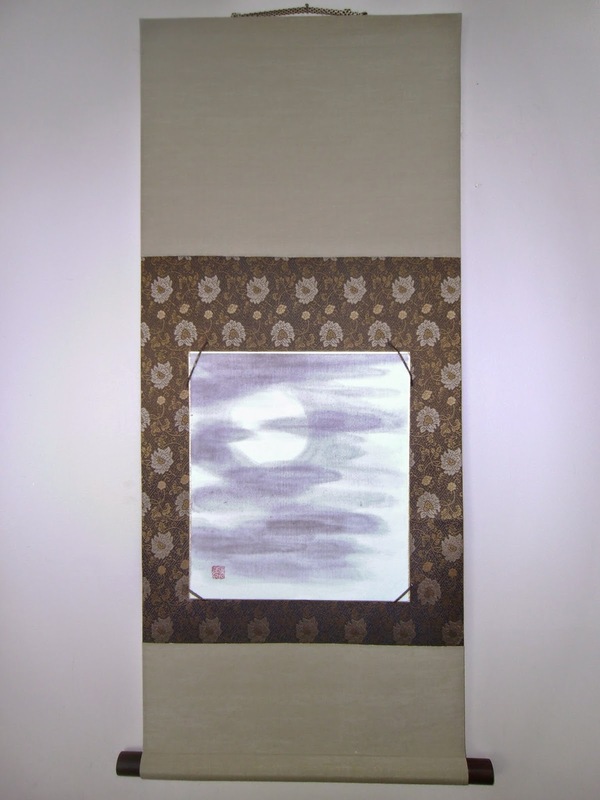 The scroll is a black lacquer with a gold ring around the end. The hanging string is the takuboku pattern (white with blue/black fleck). This is a commissioned piece painted by Mariusz Szmerdt on a shikishi (hard Matte) paper. It depicts a bald eagle flying away from a forest. It was made for a bonsai artist in the Midwest. 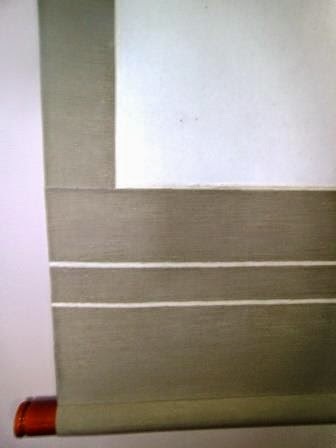 The scroll is made of a reed colored Benberugu silk. The jikusaki are Rosewood, and the hanging string is a light gold. Dimensions as follows. stone. I hope to see the final installation. I did this in the Fukuro Hyougu style as it is the most simple for me based on what the customer wanted to present. It has a very dull grey/brown cloth that is nice for a fall feeling. It was painted by Mariusz Szmerdt, and he did an excellent job. The jikusaki is a lacquer that has a red orange tint, to help visually reinforce the painting's theme of a Kaki (persimmon). 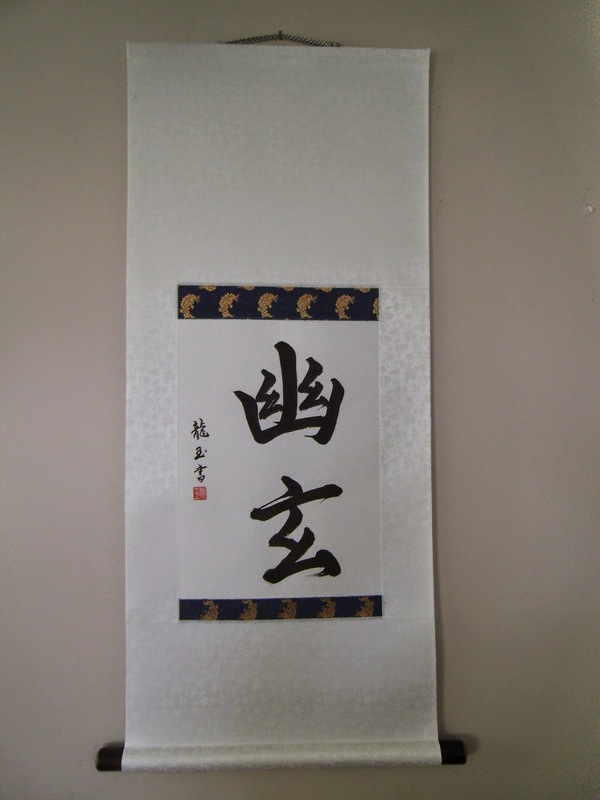 The suji surrounding the artwork and in the Ten and chi is a light gold, usukin. The hanging string is also an usukin. This is another scroll brushed by Richard Man. It is the character Mui, which in Japanese means Idleness or not working. I do not know if it is the same meaning in Chinese. Hopefully, it is not a reference to how late it was to get these works back to him. I want to get them right, and the size that he demands tells me I need to take more time. The wallscroll is completed in the Maru Hyougu style. With a gold on green Ichimonji and a Shike cloth that is a reed brown for the Ten and Chi. The hashira are narrow, but the 7 bun typically is wider than that seen on a Gyou no Gyou style scroll. A red lacquer wooden jikusaki and the Old 3 color hanging string complete the work.